Publishers use DoubleClick for Publishers (DFP) to manage and serve ads across their sites and apps, and use Google Analytics 360 to understand user behavior on their sites. DFP reports on the ads and ad units on the site, while Analytics 360 reports on the pages on the site. Each platform on its own doesn’t provide insight into the intersection of data with the other. And with two platforms speaking two different languages, it hasn't always been easy for publishers to understand how user behavior influences revenue and how ads influence user behavior. That’s why last year we launched an integration between DFP and Analytics 360. Through the integration, publishers using Analytics 360 can see DFP metrics like impressions, clicks, and revenue within the Analytics 360 interface. This enables publishers to combine revenue data with user behavior insights—for example, the number of ad impressions or revenue each page of their site generates. AccuWeather is one such publisher. AccuWeather brings real-time weather news and information to more than a billion people worldwide through its website and popular suite of apps. The company knew that if it could better understand the needs of those visitors and match them with more relevant messages from advertisers, it could provide more value to advertisers and boost its own ad revenues. By linking its DFP and Analytics 360 accounts, AccuWeather could see how the behavior of its website visitors affected revenue. With DFP metrics now in Analytics 360, AccuWeather could see that average revenue per 1,000 sessions rose by 45% on a country-level basis when two new companies began advertising on accuweather.com. This revenue increase was driven by users who were actively in-market to travel and were looking at weather in “exotic” locations such as Turks & Caicos and Barbados. With insights like these, the team has been able to create highly tailored advertising packages with high-value, unique audience segments that sales teams can sell directly or through programmatic marketplaces like the DoubleClick Ad Exchange. “The integration of DoubleClick for Publishers and Analytics 360 gives AccuWeather real-time visibility to the next level of campaign performance insights and is helping us make better advertising decisions. We’re now creating new behavior-based ad products that are being very well received by our advertisers,” says Steve Mummey, Director of Ad Strategy & Audience Development, AccuWeather. For more, read the full case study with AccuWeather. In addition to seeing DFP metrics in Analytics 360, publishers will be able to use a consolidated reporting section, see DFP ad unit data together with Analytics 360 data, and do deeper analysis on their DFP data in Google BigQuery. 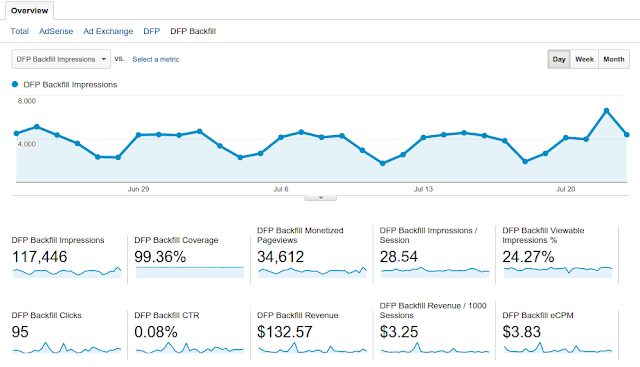 DFP metrics are consolidated into a reporting section in Analytics 360, making it easy for publishers to understand how their online content impacts revenue. The figures in the above image are for illustration only and do not represent actual data in AccuWeather’s DFP or Analytics 360 accounts. Publishers sell their online ad inventory based on the thousands or millions of ad units they have available on their properties. Individual ad slots can be grouped together into ad units so that publishers can create a hierarchy of ad units that represents the structure of their website. Then, publishers can match each advertiser’s message with the right ad slot. Through this integration, publishers can now see their Analytics 360 data through the lens of their ad units. 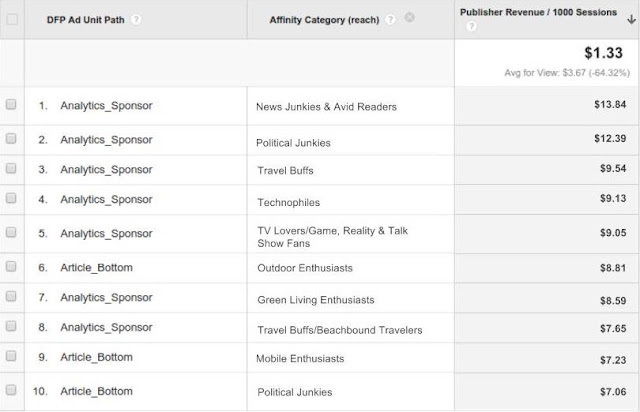 DFP ad unit hierarchy is mapped to Analytics 360 along with related metrics such as impressions, clicks, and dollars. And now that analyst and ad operations teams can speak the same language, publishers are able to analyze DFP data through the lens of demographic and interest data in Analytics 360—and they can identify things like which affinity category or user lifestyle is driving the most revenue per 1,000 sessions by ad unit. Now that DFP metrics are available in Analytics 360, they can be exported to BigQuery. This means more metrics, more exports, and more data sources. Publishers can run their own revenue models and explore in more detail the intersection of revenue and user behavior. Stay tuned for more updates from Analytics 360 as we continue to invest in new and exciting capabilities!